Delicately Delicious: Welcome to Delicately Delicious!!! Delicately Delicious is a cake cupcake and dessert bakery located in Cedarburg, Wisconsin. We offer a wide variety of cake and cupcake flavors and fillings as well as individual desserts for all occassions! We have a retail store selling cupcakes, cakes to go, cookies, bars, and other treats and we also offer pre-ordered custom decorated cakes for any occasion (custom cakes require a 7-10 day notice, please note that June is our busiet month of the year with graduation, weddings and Cedarburg's Strawberry Festival). Please see our pictures by clicking on the slide shows in the margins, or by clicking on the "Photos" tab in the header above to view all our pictures. Print a brochure by clicking in the header above. Be sure to peruse our website and blog for ideas and trends! Make your next birthday or special occassion cake double as the gift with our gift box cakes! Enjoy our fun summer ice cream cone cake (no actual ice cream :), choose from any of our cake and cupcake flavors. 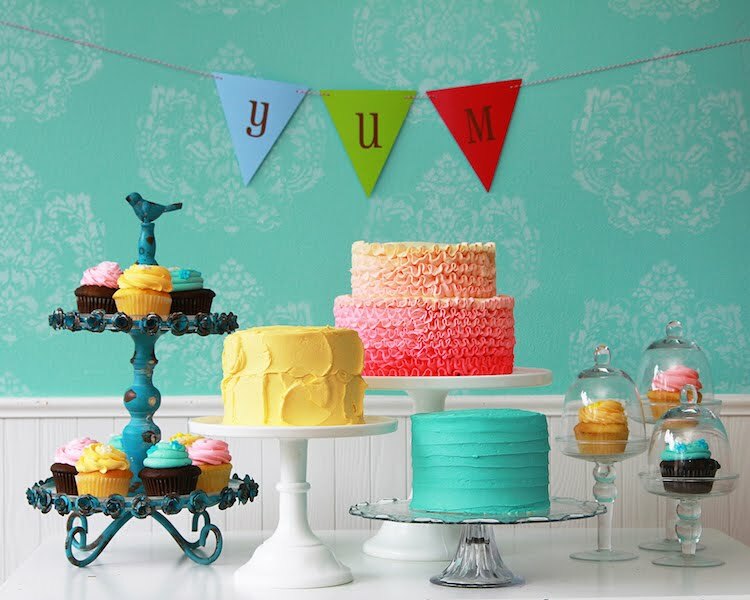 Cakes can take inspiration from invitations, paper products, or room themes. Google image search ideas or themes. Decorated cakes are fun, but we also have an extensive list of delicious dessert themed cakes, such as hot chocolate in the winter, red velvet, strawberry shortcake, or lemon. Place an order online under the "order" tab, or feel free to call us at 262/377-7268. Wedding consultations are scheduled by appointment on Wednesday & Thursday evenings, some Saturdays, or during business hours. We look forward to your order!! Is that a wedding cake? I really like it. My fiancee told me to look for one while she's looking for wedding venues in Wiltshire. There are lots of variation in making the cakes but I think I am missing one special cake which is made by reishi mushroom powder. It is very healthy and tasty. Nice design of wedding cakes. Get more collection of wedding anniversary cakes at monginis online shop with affordable cost. Awesome looking very tasty and delicious Yumm! I made an owl cake last year with fondant feathers. It was a nightmare. This would have been so much easier. I pinned it. You are so clever. The design and spatial divisions are the most influential factors in the installation and the loudspeaker for the cafe, aiming to bring the most satisfaction to customers. Customers are easy to calculate, not easy to go, customers sit and drink coffee in the restaurant rarely ask for music or complain but they will never return if the sound of the restaurant is too bad.